Taxes are one of those things that prove the major things in life are cross-cultural. We talked about love not long ago, so we will just swing to the other extreme! And with taxes comes some basics about politics, because the two subjects in tightly intertwined. Now, let’s discuss why politicians should meditate more. Politicians like to recklessly spend money. However, don’t want to spend their own money. so can just make all the other people carefully pay taxes. Their attitude is that everyone other than them are all fools. Actually, there are nevertheless a lot of people who know that it is the politicians that are the scoundrels. I recommend that politicians should meditate a lot. This would maybe help them to be able to have a proper perspective. They should think about how to let people make their own decisions about spending their own money. as well as use wisdom in helping other people. Moreover, the current tax system is extraordinarily complicated. No one is able to completely understand it. they always to to convince people that they have the ability to make things better. 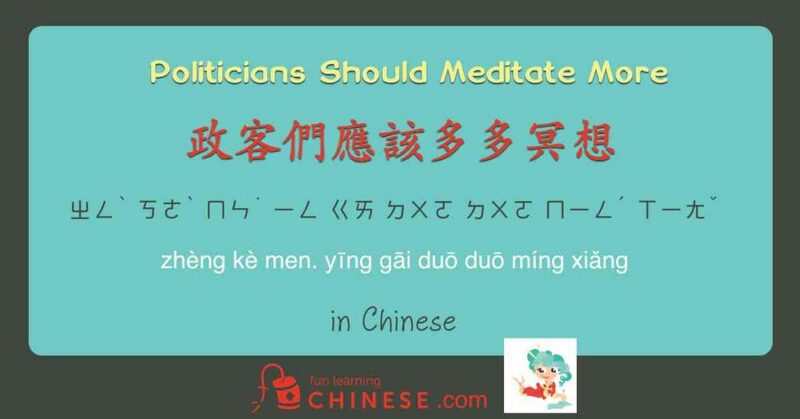 If they try to meditate regularly, (we) hope for more careful deliberations of their policy decisions, (and) perhaps this will be better for the people and the country. ❶ I was first introduced to the character 亂 in the idiom 亂七八糟 ㄌㄨㄢˋ ㄑㄧ ㄅㄚ ㄗㄠ (luàn qī bā zāo), which is something my tutor says a mom might say to a child about a messy room. So, I find it humorously memorable that it can be used in a phrase about politicians as well! ❸ Everything in the brackets  just before 人 is describing those people. ❹ This two character word (視野) is interesting for a couple of reasons. The first is that the first character in it (視) is the same one used in the word for television (電視 ㄉㄧㄢˋ ㄕˋ diàn shì), computer screen (視窗 ㄕˋ ㄔㄨㄤ shì chuāng), and field of vision (視界 ㄕˋ ㄐㄧㄝˋ shì jiè). And then there is the added twist that that last word sounds the same as the word for world (世界 ㄕˋ ㄐㄧㄝˋ shì jiè), but with a different first character. The second reason 視野 is interesting is because it is a metaphorical word, just like the words perspective or horizon are used in English. If we ask, “What is on your horizon?” or say “You need to work on your perspective.” we are hardly ever talking about what a person has in the literal field of vision (視界) ! ❺ This word 人民 is most often used for political purposes to speak of those who are viewed as citizens as a whole group. It is used in particular to refer to money in mainland China, 人民幣 ㄖㄣˊ ㄇㄧㄣˊ ㄅㄧˋ (rén mín bì) “the people’s currency”, to give the impression that the money all belongs to the people, when in fact the people in positions of power in the government have full control over the money and how it is used (as with money printed by any government). ❻ The use of the adjective marker 的 might seem repetitive here, but the first one is specific for describing the money, while the second one is particularly describing what the responsibility is. ❼ The common American phrase is to “save up” money, but the Chinese “save it down” in the pocket. 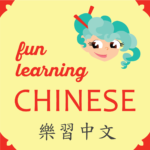 ❽ There is some variation with the pronunciation of 擁有. My tutor says that in Taiwan she grew up with it being said: ㄩㄥˇ ㄧㄡˇ (yǒng yǒu) and that is how it is in her dictionary, but she has heard it said with a first tone for the first character and this is what is in one of my dictionaries. ㄩ ㄥ ㄧㄡˇ (yōng yǒu). The specific definitions of the characters here is interesting, too. The first one, 擁, means to embrace and is also used in the word meaning to hug, 擁抱. Adding 擁 to 有, which means to have/to own/to possess, adds an emphasis of holding on to what is yours. ❿ Although the definitions 生氣 and 發怒 are basically the same in the dictionary, my tutor points out that adding 發怒 gives the picture of anger that is passionately expressed. If someone is just 生氣, it might not be outwardly obvious they are angry, but 發怒 has the character 發 which means to send out or emit. If 發怒 is used, it is obvious that anger is being expressed or coming out.